The German cuisine includes a huge variety of tasty sweets - ranging from various cakes (such as the Black Forest Cake and Sacher Torte) to Christmas specialties (such as the Christstollen and Christmas cookies) to candies (such as chocolates and marzipan). To produce all these wonderful delights, Germans have both bakeries (Bäckereien) and cake shops (Konditoreien). A bakery (Bäckerei) produces and sells breads, pastries, and cakes (Kuchen), such as Blechkuchen. A cake shop (Konditorei), however, produces and sells fancier cakes (Torten), pastries, and chocolates. Combined, there are about 300 different cakes are sold in German bakeries and cake shops. A loved afternoon break for Germans is their coffee and cake (Kaffee und Kuchen) time. This traditionally takes place around 4:00pm. Germans may go to a cake shop (Konditorei), café or visit with friends and family. Coffee and cake time involves a mouth-watering array of cakes, pastries, sweets and baked delights, along with coffee (or tea if preferred). Coffee and cake time may not happen on a daily basis, especially for those who cannot get away from work at this time, but the tradition is very much alive in Germany. It is definitely observed at least on occasion, and almost always on special days such as birthdays. As the name suggests, coffee is most often the beverage of choice. In Northern Germany, however, tea is often preferred. They take their tea plain (ohne alles), with lemon (mit Zitrone), with milk (mit Milch), or with rum or other liquor. Cookies are loved in Germany, and there are hundreds of delicious varieties. Learn about well-known German cookies. We provide photos, descriptions, as well as recipes. Germans are known for their fabulous cakes. There are two kinds: Kuchen and Torten. Learn the difference here, plus lots more information about well-known German cakes. As they say, "Breakfast is the most imporant meal of the day." 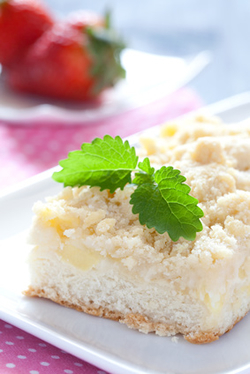 In this section, learn about several of Germany's sweet breakfast dishes. German chocolate and marzipan are well known around the world. Learn all about them here, plus information on other types of German candies. German bakeries are filled with the wonderful aroma of freshly baked pastries. Learn about well-known varieties of German pastries. Everybody needs some dessert from time to time. Learn about some fabulous German desserts. We provide photos, descriptions, as well as recipes. There are several ingredients used in German baking that are not so common in the U.S. Ever heard of "Whip It" or "Vanilla Sugar"? Learn what these are plus many others.